The Monsters Inside is one of the first three books in what is unofficially called the New Series Adventures, although even that name seems, in hindsight, ever so slightly wrong. 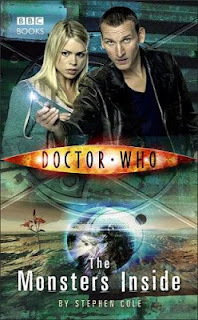 The name derives from the two other BBC Books lines that existed in 2005, the Eighth Doctor Adventures and the Past Doctor Adventures, the former of which we covered from January through April, and the latter of which we looked at alongside each of the past doctors. And the name picks up on this, implying as it does that the New Series Adventures are going to exist alongside the other two lines. In hindsight this is rubbish. Neither the Eighth Doctor Adventures nor the Past Doctor Adventures were going to survive the year. We knew that about the Eighth Doctor Adventures, actually, but as of May, when this came out alongisde The Clockwise Man and Winner Takes All to launch the New Series Adventures, the theory was that the Past Doctor Adventures were going to keep running indefinitely, with the Eighth Doctor range being folded into it. Indeed, in May the Eighth Doctor Range hadn’t actually quite wrapped yet, with The Gallifrey Chronicles coming out the next month, alongside Eccleston’s regeneration. All of which is to say that while to the mainstream Doctor Who was a titanic hit that was coming back for a second season and was set to be one of the BBC’s crown jewels, to fans May of 2005 was a bewildering period in which there were in fact three incumbent Doctors, the Paul McGann era having yet to resolve, the Eccleston era ongoing, and the Tennant era announced. And the question of what the auxiliary merchandise for the series would be like was still very much an open one. A reasonable person might have expected this to be how all of the new series merchandise would work: high end collectors items for the undiscerning Doctor Who fan with an excess of disposable income. This was basically how the novels had worked in the wilderness years, with Virgin and then BBC Books pumping out two books every month in what was actually the biggest flood of new Doctor Who material in the series’ history, especially once Big Finish got in on the act with audios. And then there was the second tradition - that of, basically, all of the merchandise prior to the 1980s. This merchandise mostly fell into two camps: expensive stuff you got at Christmas or for your birthday, and deliciously cheap stuff you could buy with your pocket money. Implicit in this is that the target audience for the merchandise was primarily kids. We haven’t actually talked about Doctor Who as a kids show much since the Hinchcliffe era, where the interplay of quite dark horror and childhood television watching formed a major part of our analysis. There’s an entire rhetoric of thought about Doctor Who being for children that’s difficult to grapple with. On the one hand it’s unmistakably the case that Doctor Who is a children’s show, both in structure and, when it’s a healthy and popular show, in terms of a large portion of its actual material audience. On the other, a large portion of its audience isn’t children, and since we’re all here it probably wouldn’t do well for us to slag ourselves off as idiots who are making too much of a kids’ show. It is often difficult to reconstruct childhood engagement with Doctor Who. It is something we tend to understand only years later, after the children have grown up and channeled their memories of Doctor Who into something else - often, as it happens, more Doctor Who. And childhood memories of Doctor Who can often be misleading: the Troughton era, for instance, is remembered for its monsters and not the parts that, to a modern eye, are far more memorable. But we can still reconstruct certain facts. And one of the most basic facts about childhood engagement with Doctor Who is, historically, the Target novelizations. Again, those interested in seeing those books covered in more detail can consult past entries, particularly those on The Smugglers, Invasion of the Dinosaurs, and Battlefield, all of which dealt heavily with the novelized versions of those stories. But the short form is this: starting in 1964 with David Whitaker’s novelization of The Daleks, and properly getting underway with Doctor Who and the Auton Invasion and Doctor Who and the Cave Monsters, published together at the start of 1974 in a manner not entirely unlike the triple release of The Clockwise Men, The Monsters Inside, and Winner Takes All, one of the most important forms of Doctor Who merchandise - indeed, by most sane accounts the most important - was a series of short books adapting television stories to prose. The reasons for their importance was varied, but had much to do with the fact that they had a sort of breathlessly functional prose provided by Terrance Dicks and that before the invention of the VCR the novelizations were the only way to re-experience a story after transmission. And, perhaps more importantly, with the fact that they were quite cheap. The result was that children grew up on these books, and in several cases the books are actually better remembered than the stories they adapt. And so what we got was… a rather strange midpoint. The New Series Adventures are, from their very name, aimed at adult fans. Their pricing and format pushes in that direction as well - unlike the Eighth Doctor and Past Doctor Adventures they’re hardcovers running about twice the price. These are not books aimed at being picked up by kids with their pocket money. On the other hand, they’re shorter than the other two lines - only about 250 pages - and consciously written at a younger audience (remembering that, to start at least, the BBC Books line was meant to be aimed at a younger audience than the Virgin one - though it’s tough to argue seriously that that mandate held to the end of the line). So what we have are kids books that are sold to adult audiences. And, of course, there’s the writers. Five of the first six books came from mainstays of the BBC Books line: Justin Richards, Stephen Cole, Jacqueline Rayner, and Steve Lyons. (We’ll deal with the sixth in just over a week.) The line was still overseen by Justin Richards, who had overseen the disastrously stupid amnesia plot line that marred the latter years of the Eighth Doctor Adventures. The Monsters Inside comes from Stephen Cole, writer of the equally disastrously stupid The Ancestor Cell. It’s not that the BBC Books lines were unmitigated disasters - actually there are some really good books out of them. But they weren’t straightforward successes either. It would, of course, also be a mistake to suggest that the New Series Adventures were completely beholden to the past. The Monsters Inside is a Slitheen story, drawing primarily from within the existing continuity of the new series, such as it was. And, as we noted, the books are almost ludicrously deferential to the possibility that someone might be entering Doctor Who through anything other than the massively popular television series. The result is a book that feels as though it’s lacking in audience. Which is in many ways secondary to the fact that it’s lacking in point. There’s a vague sense that this might be a book about prison abuses (another piece of evidence in the increasingly convoluted question of who this book exists for), but if so only in the most superficial of ways. Mainly it’s trying to be thrilling, which is a not entirely absurd goal, but which pales so starkly in comparison to what the television series has been doing for the past eight weeks that it seems almost bizarre to do this and call it Doctor Who. And this is tough to escape - even the covers, frankly, feel like lazy attempts to look like generic and harmless tie-in merchandise. It's next to impossible to imagine a good K-KLAK coming out of this line. Which is the problem this approach faces, at the end of the day. The Target novelizations were not great works of literature, but they were still basically A-list Doctor Who. Yes, some years the A-list included The Monster of Pleadon or The Android Invasion, but they were the proper Doctor Who stories recounted deftly. This, on the other hand, is the skippable Doctor Who in a world where Doctor Who is omnipresent already. If anything the thing they correspond with best are the old World Distributors annuals. But even those existed for a period where the audience was starved of Doctor Who at all, not just starved for a new episode. These are at best for kids starved for new Doctor Who. Obsessives who simply cannot wait for a new episode of Doctor Who. And, more to the point, who have adopted Doctor Who as the thing they’ll ask their parents for. They are tools for people to commit themselves early to a phase of Doctor Who fandom, and ideally for a lifetime of it. In this regard there’s something ever so slightly unsettling about them, especially inasmuch as The Monsters Inside is actually referenced in Boomtown, giving it a curiously “official” feel that feels ever so slightly cynical. It’s a sense that Doctor Who’s main purpose is to make a lot of money. Its method in doing that might be “make good television,” and if so, it’s a rather lovely method, but it also feels ever so slightly like a Rupert Murdoch clone wearing the Reithian public service mission of the BBC as a skinsuit. And yet there’s a possibility here. These books may be a small part of Doctor Who and a not very good one, but those have existed at every single turn of Doctor Who, including the fan-driven memorabilia era of the 1980s, and have had their odd influences on the program. Gareth Roberts nicks imagery from the Patrick Troughton Polystyle comics. Grant Morrison name-checks the Fish-Men of Kandelinga. Frobisher appears in a Rob Shearman audio, then a Rob Shearman audio gets adapted for television. The Monsters Inside includes a reference to the Meeps, from early Doctor Who Magazine comics. The Pestacons was mistaken as an important story worth novelizing. Russell T Davies worked kronkburgers into The Long Game. Odd things recur, such that we might, when some 2042 television producer finally caves to pressure to bring back the Slitheen for the Christmas special even though they only appeared in two stories nearly forty years ago, we might just get an off-handed reference to their sibling family the Blathereen. In other words, whatever the motivation here, this is the sort of thing that has existed any time Doctor Who has been in a generally healthy state. Its quality is almost beside the point, as is the clarity of its purpose. When Doctor Who is doing well, it generates strange auxiliary merchandise. That, at least, is happening. I think something about your time zone is off, because it's still Sunday. For a great example of superfluous merchandise, I point no further than my Sonic Screwdriver universal remote control. I do not own a television, and it doesn't work so well with the little boombox stereo I have in my bathroom. But I love the noises it makes. I was sorely tempted by that Winston Churchill figure, but in that particular case sanity prevailed. Whenever I see the books or merchandise on a shelf in a bookshop or toy store I feel almost obliged to buy the hell out of that crap. After all I'm a Doctor Who fan, isn't that what I'm supposed to do? Sanity, as Scott says, prevails but then I feel a little guilty for not supporting the team. This is quickly replaced by smugness that I'm not one of *those* fans. I've bought the odd thing, each time with it's own justification. The Cyberman and Dalek voice changing helmets might come in handy as props for a performance piece (I teach drama). The sonic screwdriver and Chameleon Arch pocket watch look nice on my bookshelf. The Tardis moneybox is useful for saving loose change etc. I've resisted all the books (except The Whittaker Hartnell adaptation which is great and the recent Moorcock which isn't). The hardest thing is persuading friends and relations that no, I don't want anything Doctor Who related for my Xmas/birthday present. "But you love that show!" Yes I do...that's why I don't want an ironic Tom Baker mug. After buying several whirring TARDIS cookie jars for other people, I finally bought one for myself. "We might, when some 2042 television producer finally caves to pressure to bring back the Slitheen for the Christmas special even though they only appeared in two stories nearly forty years ago, we might just get an off-handed reference to their sibling family the Blathereen." The Pestacons was mistaken as an important story worth novelizing. Pescatons, surely? The Pestacons are, I presume, five slightly different species of cockroach that transform into villainous robots, and which combine to form That Thing Out Of Mimic. I was born in the wilderness years and was introduced to Doctor Who when I was about 5 or 6. Consequently, I was considered too young for the Virgin books and the uncle who introduced me to Who thought that the eighth doctor adventures were rubbish, so that when the new series adventures came out I was excited that for the first time ever I'd be able to read the books. Even as a 12 year old I knew that they were absolutely rubbish and I felt almost betrayed, because they were so obviously just a way to get money out of fans with no real thought put into them. I borrowed a few of these books from my local library, ooh, such a long time ago. I read The Clockwise Man. It was okay, very bland and unremarkable, and as it turns out, quite forgettable. Some of them are so forgettable I'd only remember reading them if I looked up the list of titles and synopses to see if they jog my memory. The only one that really sticks in my memory is The Story of Martha, which seemed to do something a little different to the others, so I'm guessing you'll cover it when the time comes. I buy Doctor Who stories. I don't care what form they take, but that's what I spend my money on; so I am not tempted by toys, towels, and what have you. Since I am sort-of in debt because of the number of Doctor Who stories I buy, thank Crunchie I do stop there! I agree that this trio of books were forgettable (The Clockwise Man probably least so); the next set was more variable, with one I particularly disliked (The Stealers of Dreams), one okay but not spectacular (The Deviant Strain - hm, Richards again), and one I think is great - and which I presume you'll be covering next week. I look forward to it. Oh, I do have an adipose stress toy. But that was a gift. Well there was at least one proper book that came out of it--The Eyeless, which I think was the best part of the "season of specials." God I remember when the Target books first came out! For years I'd had the 3 Hartnell books in hardback, but suddenly there was a 4th Book, and it was the Auton Invasion that I remembered watching a few years before. And of course I had to rebuy "Zarbi", "Daleks" and "Crusade" in paperback too. Putting Target books on the shelves was the first iteration of what all Who fans now do with DVDs (and prior to that, VHS) - Putting them in order in a row and just sitting back and looking at the spines. And wasn't it annoying when the colour or logo wasn't quite right? It really is a the second Golden Age for Who merchandise (the first of course being the Dalekmania 60s). If I could send my 10 year old self a photograph of all my CO figures on the shelf (including 5 Flight Control TARDISes and Heaven knows how many Daleks) he'd chew his own arm off out of envy. The only one of these I've read so far is I Am a Dalek and for what it was, I really enjoyed it. I think I just got lucky, though. I liked The Stealers of Dreams. Especially the Judge Dredd expy. The New Series Adventures are, from their very name, aimed at adult fans. Their pricing and format pushes in that direction as well - unlike the Eighth Doctor and Past Doctor Adventures they’re hardcovers running about twice the price. These are not books aimed at being picked up by kids with their pocket money. Great essay bit I don't think the section above is quite right. These novels were actually only £1 more than the EDAs (£6.99 as opposed to £5.99) and they could be picked up discounted in most bookshops/supermarkets making them very pocket money friendly. Around this time small, jacketless hardbacks books were very much in vogue among children's books(e.g. A Series of Unfortunate Events). Most importantly, they were shelved in the children's section of most bookshops, rather than the adult sci-fi section. All of which shows that (in terms of marketing at least), they were predominantly aimed at kids. I listened to the audio book of "The Stone Rose" a while back, as well as... the space pirate one. Don't remember what that one was called. Really enjoyed them, but don't really remember a lot, apart from a scene where the Doctor has to fight in a gladiatorial arena, which was kind of fun. Oh, and one of the boy characters turned out to be a girl. Maybe. What's particularly interesting from the merchandise point of view is how flexible BBC is to allowing non-official merchandise. Searching Etsy for "Doctor Who" will bring up hundreds, if not thousands of results, most of which are made by fans out of love for the series. Much of it is actually much better - either in terms of creativity or quality - than the official stuff. The Doctor Who t-shirts that both my husband and I have are completely unofficial and much more clever than the official ones. He has this one from the "Fighting Time Lords" (http://sharksplode.com/fighting-time-lords/), while I have one with the TARDIS in the Bayeux Tapestry (http://www.etsy.com/listing/82449930/tardis-bayeux-tapestry-doctor-who-t). I assume that unlike other organizations (George Lucas), BBC recognizes that the unofficial merch is important to the fanbase and builds its enthusiasm for the show, rather than taking away from official merchandise sales. I think Phil might be missing something about the childrens book market for many of us: books are something that others buy for you rather which you buy for yourself as a child. So the New Series Adventures are aimed at adult buyers, but not adult readers. Books were what I begged adults for as a kid. There is something parent-friendly about a hardback book (the book as hard-wearing investment) rather than as a paperback (disposable, cheap, not worth the money). Also a significant market was, if not now, public libraries and school libraries, where a bit of hardback hardwear is more attractive. I remember my local library as a kid having lots of Target novelisations in hardback, something I never remember seeing shops. I could have sworn there was a sentence about this in there, but it seems I only danced around it - but yes, this is what I was referring to when I described them as "These are at best for kids starved for new Doctor Who. Obsessives who simply cannot wait for a new episode of Doctor Who. And, more to the point, who have adopted Doctor Who as the thing they’ll ask their parents for." - these are books for parents to buy their Doctor Who obsessed kids. That is different from the Target novelizations, which were, by all accounts, aimed for kids. As for hardbacks in the library, library bindings are not usually available for the general public, and at least some libraries rebind paperbacks as hardcovers themselves. I'd kill for an ironic Tom Baker mug. The only merchandise I can ever seem to find consists primarily of boring, generic T Shirts with various things Matt Smith has said on them. I love Matt Smith, but the memorabilia invariably highlights the least interesting aspects of his Doctor. Probably the most important thing to me when reading a book based on characters from a performed medium is that I can imagine the dialogue being said by the actors. Captain Jack's dialogue totally failed that test. It's not the author's fault since there was no chance to see John Barrowman's performance before writing, but it still wrecked it for me very early on. The same happened with Sick Building, a well-received book which I had trouble getting through because I couldn't picture David Tennant saying the Doctor's lines. I only managed to finish it once I imagined him as Peter Davison's Doctor instead! The day I buy a Winston Churchill action figure is the day I slit my own throat. Well I know what somebody's getting for Christmas. You could at least do something, shall we say, "creative" with it, no? Honestly, I just really wish they'd reprint at least some of the better BBC Eighth Doctor books (dunno what the legal situation with the New Adventures is), especially since they've been reprinting select books for the 50th anniversary. But they picked Earthworld of all things for McGann! EARTHWORLD! Not Alien Bodies? Or Interference? Or Vampire Science? Sheesh. I very nearly spent about £15 on a sonic screwdriver that was actually a screwdriver. My sister had to ask me "How often do you use a screwdriver?" I did get a sonic screwdriver stylus for my Nintento DS, which thanks to the prongs on the Matt Smith model is probably the worst DS stylus ever. Given that the Seventh Doctor choice was "Remembrance" - the only novelisation in the bunch - I suspect the legal situation with the NAs is "Aargh!" Things could be lots worse than Earthworld. Earthworld is fun. And Anji's emails are both hilarious and poignant. It did seem to me that Magrs had somehow managed to write Tennant as early Matt Smith. I didn't have that problem with Stealers, but I may have a tin ear. Also, I only read it this year, and the book passes the 'can you imagine John Barrowman saying this dialogue' test better than any episode of Torchwood. I suspect that the reasons for choosing Remembrance included that it's a decent dalek story, and that Aaronovitch has gone on to write not-Doctor Who stuff that people can buy in non-specialist bookshops. And Remembrance is a lot closer to the NAs than it is to a Terrance Dicks novelization. I'm reasonably likely to cover the novelization in the McCoy book - I would have in the blog, but Remembrance was already so long. It and Doctor Who in an Exciting Adventure with the Daleks are the only two novelizations I feel like I was wrong to skip. Guess that's another essay for the Hartnell book. Bugger. Once you start down the road of COLLECTING, it's hard to stop. It seems almost like a duty. I bought the New Adventures long past the time I stopped enjoying them -- maybe they'd get better? -- and now wish that I'd gone only a few more and read Lungbarrow. Or, in the Missing Adventures, Cold Fusion. Giving up was hard. And it doesn't help for the next time that I have those two regrets for not sticking it out. For years I had a Star Wars comic collection that almost rivaled Rich Handley's. I had every novel with three exceptions. And again, one day I stopped, looked, and realized that it had been some time since they'd given me a sense of delight. And so they left. I hope to grow more discerning. We'll see. I don't know....just seeing the words "Winston Churchill action figure" together make me happy for some reason. Maybe I should hunt this down. ....nah. On second thoughts, I'm content with my Charles Dickens trading card (Yes, Doctor Who did spawn such a thing. Man, I love this show). It's interesting - well, vaguely interesting - that they didn't try to make the action figure look more like Winston Churchill rather than the actor that played him. Legal situation with the New Adventures is fairly simple, I believe: copyright has reverted to the authors, so all the BBC would have to do to reprint is sign a contract with a given author. Certainly there was no problem when The Dying Days, Lungbarrow and Human Nature were made available on the BBC website. One of the nice things about the New Adventures, at the time, was the sense of a continuing story rather than just individual books, but it does rather make it hard to just pull one out of the middle. It's funny, I despised "Victory of the Daleks" in nearly every way...and yet I still coveteth a khaki green Dalek with a tea tray. It's just adorably ridiculous, and one of the few things in that script that works. I just wish i didn't have to pay through the nose & get stuck with a dodgy Churchill. I've given that set as a gift...four times I think. There is just something about a Dalek and Churchill that is lovely. I'm not going to lie: as more stuff creeps into the Hartnell volume, I am getting more and more excited for it rather than Tom Baker. But that could be the fact that I can't stand Baker, and absolutely adore Hartnell. Oh look! It has three settings! Oddly, even though I am the one who introduced her to the show, my ex-fiancee/roommate is the one who actually owns Doctor Who merchandise: a sonic screwdriver (non-lighting/noisemaking, basically just molded plastic), a plush talking Dalek (it's bright red and says "Exterminate!" or "You would make a good Dalek!" when you squeeze it), and a framed reproduction of Van Gogh's TARDIS Exploding. I prefer to think of sonic screwdrivers and Daleks as me merchandise. Well, they're "you" merchandise as well as "Who" merchandise. Both, after all, answer The Question.